This streamlined gadget keeps five necessary tools together in one place. Somewhere, among the take-out menus and paper clip clusters, there's a screwdriver. Where the level and ruler are is anybody's guess. Keep some of your most essential tools together with this 5 in 1 design. 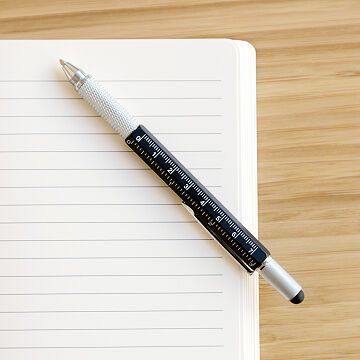 The streamlined gadget features a screwdriver, capacitive touch stylus for smart devices, an integrated bubble level, ruler, and pen with clip. Store one in your purse or glovebox for on-the-go use, and call off the junk drawer search. Made in China. Fun to shop because of an interesting selection of gift ideas. This is a great product. My dad loved it. It's a good mix of unique and useful. My brother is going into architecture and loved all the features this product had to offer. It is stylish, well-built and easy to use. Yes, the ordering and receiving were so easy and quick. My Husband loves the 5-in-1 Tool pen. He uses it at work everyday. He did not provide any negative feedback. You never need a ruler or level until you do. Put it into your pen jar at home or work. I gave this pen to my office mates. We are always looking for a little screwdriver to change batteries, or fix eye glasses, or whatever. Perfect.